Alexander Henderson, Robert Baillie, George Gillespie, Samuel Rutherford. 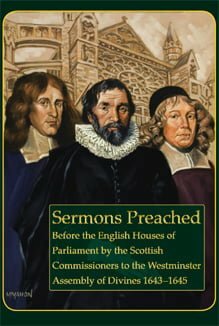 Sermons Preached before the English Houses of Parliament by the Scottish Commissioners to the Westminster Assembly of Divines, 1643–1645. Introduction by Guy M. Richard. Edited by Chris Coldwell. October, 2011. 592 pages. Retail $54.50; See online store for sale pricing. Hard bound, Smyth sewn, dust jacket, color frontispiece. Portraits by Mike Mahon. Author, Subject and Scripture indices. Bibliography includes collation of works/resources available to the divines at the Westminster Abbey, Sion College and Lambeth Palace libraries during the time of the assembly. Now available, a new edition of the sermons preached by Alexander Henderson, Robert Baillie, George Gillespie and Samuel Rutherford, while commissioners at the Westminster Assembly of Divines, 1643-1645. These nine sermons previously were published serially as a set in the first volume (four issues) of the Anthology of Presbyterian & Reformed Literature (1988), the first publication endeavor of Naphtali Press. That earlier edition was very much a freshman effort in working with seventeenth century texts, and as such was marred by mistakes and the nature of working to deadline for a serial publication. The text presented in this new volume has been significantly revised and improved, and proofed anew against the originals and many corrections made. Most notably, missing words or phrases inadvertently dropped in the first transcription were corrected. Through considerable research, the notes have also been extensively expanded, providing bibliographic details of referenced works, and attempting to trace all the literary, classical and patristic allusions. The Bibliography notes the works referenced in these sermons which may have been found in the Westminster Abbey, Sion College and Lambeth Palace libraries at the time of the Assembly (more extensive research on the divines’ literary resources is presented in Coldwell, “Westminster Abbey Library: The Theological Resource of the Assembly of Divines (1643–1652),” The Confessional Presbyterian 6  263–282). Commendations from William S. Barker, Chad B. Van Dixhoorn, John R. de Witt and Joel R. Beeke. Not long after the Solemn League and Covenant between England and Scotland was achieved in September of 1643, the four Scottish ministerial commissioners to the Westminster Assembly, Alexander Henderson, Samuel Rutherford, Robert Baillie, and George Gillespie, were offered the opportunity to preach before the House of Commons on the monthly fast day (the last Wednesday of the month) from December 27 to March 27, 1644. Then they preached before the House of Lords in the same cycle from May 28 to August 27, 1645. In between, Henderson preached the thanksgiving day sermon before both Houses on July 28, 1644, shortly after the July 2 victory of the Parliamentary army at Marston Moor. This book provides a carefully edited version of these nine sermons, preached by influential formers of the Presbyterian heritage at a crucial juncture of history. —William S. Barker, Author of Puritan Profiles and Editor (with Samuel T. Logan, Jr.) of Sermons That Shaped America. The Scottish Commissioners to the Westminster Assembly were not only valued by the synod’s members, but also by the public at large. In this elegant edition of their fast sermons, we have access once more to their carefully framed addresses to the English parliament, a body which maintained a complicated and sometimes fraught relationship with the Scottish kirk throughout the English Civil Wars. Scholars will welcome Chris Coldwell’s bibliography of texts cited in these sermons. A general readership will be pleased with the modernized spelling and punctuation of the text. Naphtali Press is to be commended for its continued publication of rare seventeenth-century theological texts. —Dr. Chad B. Van Dixhoorn, Westminster Assembly Project. In a profound sense of the word these sermons by the Scottish Commissioners to the Westminster Assembly are beyond praise. They were preached by mighty men of God who stood head and shoulders above most others in their own or any generation. Their piety, knowledge of the Bible, learning, and gifts for leadership could not be questioned. An outstanding characteristic of these astonishing sermons included in this volume is just the degree to which the men who delivered them were prepared to speak the truth to powerful politicians and statesmen. They did so with dignity and appropriate respect, but their primary concern was that they remain faithful to the Lord God who had called them to be his spokesmen. The period in which they flourished must be reckoned as among the most important in religious and political history. Great issues hung in the balance. The Westminster Assembly had been summoned by Parliament and was therefore in the first instance answerable to it. A great struggle was taking place, both on the field of battle and in the effort to establish a truly Reformed church in England. During the Assembly’s protracted debates and from the pulpits of St. Margaret’s Church and Westminster Abbey, these commissioners bore unexampled witness to the truth of the Word of God. No doubt one should observe as well that the degree to which the House of Commons and the House of Lords were prepared to hear such preaching underscores the seriousness with which those on the political side took their own responsibilities. Chris Coldwell and Naphthali Press have presented us with a substantial gift in the publication of this volume. —Dr. John R. de Witt, Professor of Church History and Systematic Theology, Reformed Theological Seminary, Jackson, Mississippi (1975–1982), and author of Jus Divinum: The Westminster Assembly and the Divine Right of Church Government (1969). The Scottish Commissioners to the Westminster Assembly shone like a constellation of stars in the darkness of the world. They were profound theologians, brilliant debaters, bold preachers, and prayerful Christians, deeply valued by their colleagues and laypeople alike. This collection of sermons by Baillie, Gillespie, Henderson, and Rutherford—conservatively modernized with contemporary spelling and punctuation—addresses a range of topics from the kingdom of Christ to the kingdoms of men. It will be a blessing to students of historical theology, friends of Presbyterianism, and all manner of godly Christians on both sides of the Atlantic. —Dr. Joel R. Beeke, President, Puritan Reformed Theological Seminary, Grand Rapids, Michigan.